Spring is coming! Time to get your finances in shipshape condition. Here are five ideas to get you started. While you’re reviewing your expenses and debts in order to see how you fared last year in terms of staying within your personal budget, make sure that there aren’t any expenses or debts on your credit report that aren’t yours. If you find yourself with open accounts at multiple banks, it may be time to consolidate, depending on your balances. (FDIC insures each account up to $250,000.) By consolidating, you are in a better position to negotiate for lower fees and better interest rates. You may find that you want to move your banking life online in order to reduce clutter and find a bank paying the highest rates / charging no fees. But be sure to back up your statements (and make backups of the backups) since most banks only keep them around for 12-18 months. 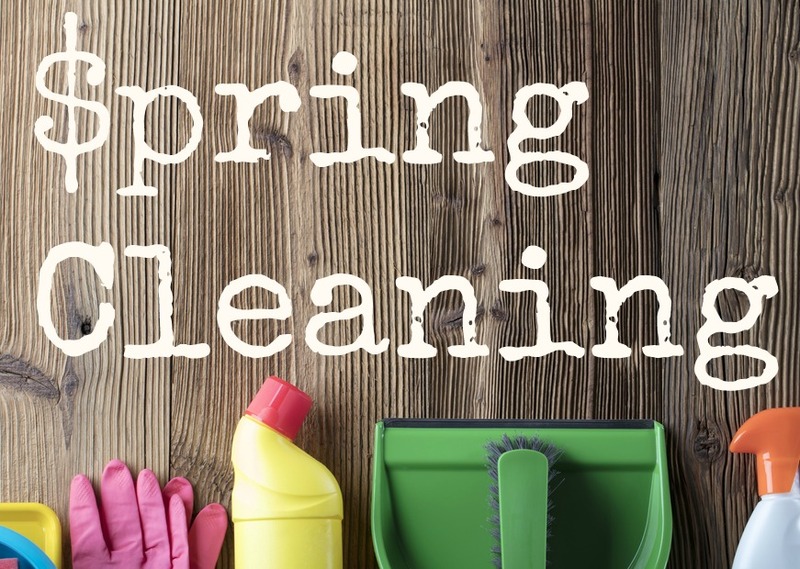 Your home is likely one of your bigger assets, so put home maintenance projects on your list of financial spring cleaning projects. Repair any roof leaks the minute you spot them to help prevent mold, structural damage and loss of personal property. Make sure your gutters and downspouts are clean and debris-free every year. Water on the ground can cause even more expensive problems. Grading and drainage issues need to be dealt with lest they damage your home’s foundation or cause flooding, often not covered by insurance. Deal with plumbing leaks immediately. Inspect and caulk around showers and tubs as well as windows and doors on a regular basis. Caulk is cheap, but water damage is very expensive. Just like you remove lint from your dryer vent with each load of laundry, you should change your HVAC filter monthly to prevent system problems as well as reduce monthly electric bills. Take immediate measures to eliminate pests like termites, roaches, ants or rodents if they take up residence. Waiting can only lead to more damage. Very importantly this year, get up to speed on the new tax changes and how they might affect you by meeting with your financial advisor and tax specialist. Make sure you review your retirement tax distribution plan in terms of RMDs (Required Minimum Distributions) which start at age 70-1/2. In terms of tax document storage, Kiplinger recommends keeping your tax returns indefinitely, and supporting documentation for seven years. If you decide to clean out old tax supporting documents, make sure to shred them to reduce the possibility of identity theft. You may not realize that the beneficiaries you have listed on your insurance policies and retirement accounts take precedence over wills and trusts. It’s really important to keep all of your documents, including your estate documents, up to date at all times. Life changes, and so does your family. You probably don’t want an ex-spouse receiving your 401(k) money if you pass. If you have a lot of assets and a large estate, you may want to meet with your financial advisor and estate attorney since the new, higher estate tax exclusion sunsets in 2026. Still have an old retirement plan at a previous job? Let’s talk about rollovers. We can show you your options and how your overall financial picture may be affected by each choice. Call Alpha Beta Gamma Wealth Management at (866) 837-0999.